As you starts to get to grips with learning Tai Chi, you will probably realise that feeling Qi (Chi) is the key – and you would be right! So…why is this? Before we set about looking at why your practice of feeling Qi is so important, lets first look at what Qi is. In fact let’s go back a little more and understand the framework within which this explanation of Qi sits. Reality only exists (for you) in ‘the present moment’ when you start to describe and define reality you may easily step back from it and move into what you ‘think about it’ and when that happens you are one step removed from reality and in fact it no longer exists (for you) – reality is gone until you choose to return to it. So… Qi exists as one aspect of our pure experience of reality – its a feeling and its wordless. We can use words to describe it, but the words aren’t it! Qi exists in a realm that is different from knowledge, it is our experience of ourselves, our body, our emotions our subtle sense of life itself. Qi is a ‘vibe’ and your vibe relates to vibes around you, from beings and objects that you connect to. Qi is the ground, the air, the trees and plants, the changes and events that you are part of. Qi is people and animals in relationship. Qi is sensory and on a subtle level is also beyond sensory. Qi is universal. The method to develop your ability to feel Qi is so simple, just practice Tai Chi movement and keep focussing your attention on what you feel. At first this does not seem that it would lead anywhere but in time learning to feel Qi can bring profound benefits. 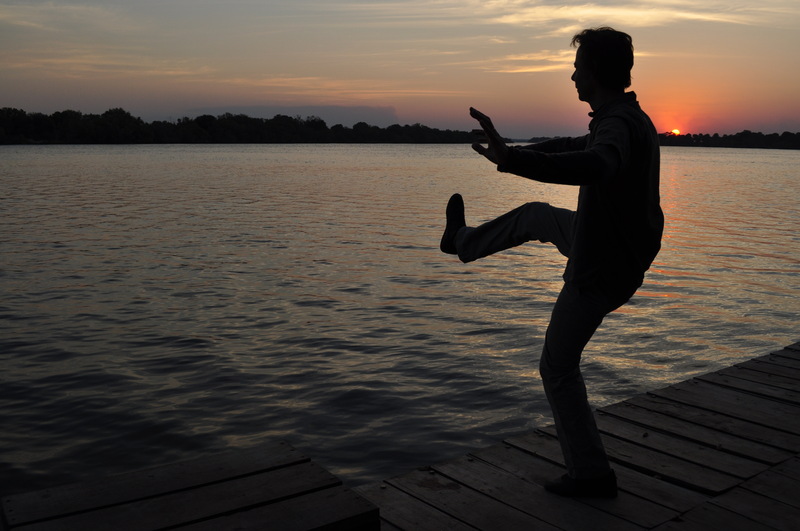 Feeling Qi is the key to unlocking most aspects of Tai Chi. So lets give ourselves an overview of these and then we can return later to look into each one more deeply. Focussing on feeling is a kind of meditation, which enables you to develop your mind. It is the practice of focus itself. It develops the basic passive/awake state of mind. Feeling your body enables improvements to posture, body mechanics and deeper aspects of body alignment. As we get stable in our ‘felt sense’ we can locate tension. Once found we can begin to learn to release tension- this process starts with obvious physical tensions, continues into emotional tension, which can go back to our experience of significant past events. Ultimately we can find the most subtle layers of ‘existential’ tension. Our ability to work in the Qi level starts to bring insight into health and healing. We can experience how we move in a constant cycle through high and low energy states, we see how energy flows and circulates – both within us and in relation to people and our environment. Bringing our attention to our breath is a huge aspect of feeling Qi, we notice where the breath goes, its quality and how it relates to mind, relaxation and movement. We can learn to change how we feel – by breathing. Learning to feel can be applied to what we consume. We can really taste food and notice how it makes us feel. We can uncover hidden desires for consumption that are driven by how things make us feel – especially alcohol and drugs. Qi is intimately intertwined with what we eat and drink. Tai Chi is Yin/Yang and, in our experience of Qi, we can start to discern the ‘dual aspect’ of what we feel. One part still one part moving, full and empty, expanding/contracting, up/down, forward/back and on and on. In our study of feeling we can experience how our mind and body together initiate movement. We develop our ability for intentional movement in time we can discern intention itself. With good guidance from an experienced teacher we can keep working with feeling Qi to develop the Three Treasures – Jing, Qi and Shen. This is ‘the system’ of Tai Chi training from physical health through vitality to spiritual attainment by working at ever more subtle levels of feeling. Lastly (and optionally) if we continue for long enough to develop our Qi we may become a proficient internal martial artist. Who would guess that something as simple as learning to feel could offer the potential to take you so far on a path of self development – and be fun/enjoyable most of the way. Happy Qi.